Norfolk, Va. - (March 3, 2016) - For Rent Media Solutions™ (FRMS), a key player at the forefront of the multifamily industry for more than three decades, has added drone video and photography to its robust list of products. Today’s consumers not only desire, but demand, visual content. ForRent.com® (as it is known by apartment shoppers) was the first to provide customers with a digital video marketing solution and is now going one step further by becoming the first in the multifamily space to offer aerial videos and photography nationwide. Commercial drone use is soaring. It is projected that 1 million drones, also known as quadcopters, will be sold in the U.S. in 2016, a 145 percent increase from 2015. FRMS and its partners have been researching the drone industry and FAA regulations since early 2015 and fully understand these regulations. The company is excited to add licensed drone pilots and FAA-registered drones to its already extensive arsenal of videographers. ForRent.com currently hosts nearly 8,500 videos, and the addition of drone photos and video will greatly expand its customers’ options. 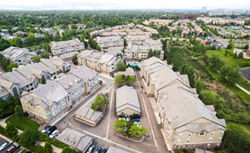 Joining the agriculture, construction, energy, rail and other industries, FRMS is proud to be the first in the multifamily space to offer a forward-thinking aerial video product to all of its customers nationwide. This new product represents an amazing opportunity for property management companies, as drones are ideal for capturing large pieces of property and apartment communities with unique and aesthetically pleasing features. In fact, according to VideoBrewery.com, real estate listings with videos receive 403% more inquiries than those without. Additionally, business2community.com states that 80% of online visitors watch a video, while only 20% read content in its entirety. For more information and to see an example of aerial video, check out Taking Drone Use to New Heights. Founded in 1982 as For Rent Magazine®, For Rent Media Solutions™ (FRMS) is headquartered in Norfolk, Virginia, and provides property managers and owners with diverse marketing and advertising products, services and education. These products are easy to use, easy to understand, and designed with modern renters in mind. For apartment shoppers, FRMS provides robust community listings in a multitude of media, including print, social, online, mobile, video and an extensive distribution network. FRMS operates four websites: ForRent.com®, AFTER55.com®, CorporateHousing.com™ and ForRentUniversity.com®. FRMS has been a forward-thinking leader in the multifamily industry for more than three decades. With a sales force more than 300 strong (the largest in the industry), FRMS takes pride in helping customers to drive leads, retain residents, and build and maintain their brands. Additionally, ForRent.com listings receive exclusive distribution to Homes.com® Rentals. Visit ForRent.com for more information and our Apartment Professionals Blog for industry knowledge, tips and ideas. As one of the nation’s leading online home search destinations, ForRent.com® inspires renters to discover their next apartment, loft, townhouse, or condo. ForRent.com features rental listings in a user-friendly format, making finding your next home an easy exploration. Visitors to the ForRent.com blog will discover relevant information and can join the conversation surrounding home decorating style, apartment hunting tips and more. ForRent.com serves as the complete resource for renters in every part of their living experience. Begin your apartment search today with ForRent.com, one of ForRent.com’s mobile apps, ForRent.com Magazine or search ForRent.com on YouTube. For decor tips and more, visit the Apartment Living Blog and don’t forget to check us out on Facebook, Twitter, Instagram, Google+ and Pinterest!